Seed Street, a hydroponic farming venture and food-justice initiative that grows fresh produce inside shipping containers, arrived in Harlem in the summer of 2015. It was brought there by Leigh Ofer and Hannah Bronfman. The idea came from an environmental justice class Ofer took in college, as well as Bronfman’s deep ties to the Harlem community and her advocacy for healthy living and positive body image. Ofer believes this issue is at the heart of America’s health crisis. “It’s really impossible to eat well, to feed your mind, body and soul,” she told the Independent. “Growing up in Israel, in an agricultural society, eating healthy was a by-product of living. You don’t think about it. But, in the U.S., it takes jumping through hoops just to eat healthy – a total polar opposite on the spectrum. When Ofer was searching for solutions, she came across a new development in agriculture. Cutting-edge farmers and technology geeks were building hydroponic farms inside shipping containers. The idea immediately resonated with Ofer, partially because of her family background in shipping. When Ofer met Bronfman a couple of years after having come across this idea, the two decided to take a leap of faith together and go for it. With limited resources, they kicked things off with one container. It landed at their community partner’s yard – the Children’s Aid Society – in July 2015, and they have been growing tomatoes, leafy greens, herbs, peas and cucumbers ever since. “We are retrofitting freight containers with hydroponic growing technology and bringing the farm back to the city,” said Ofer. “You can put these farms almost anywhere. Each farm container has a very high yield, equal to about an acre of traditional farming and using 90% less water and 75% less fertilizer. All you need is an electrical outlet to hook up to and a water supply. We had a plethora of tasty, healthy veggies in our last harvest. The program was successful and involved the community and especially kids, who learned by doing how foods grow and the different ways food can be eaten and enjoyed. Community members participated in planting, harvesting, managing the farm stand and creating recipes for the fresh produce they brought home, not to mention yoga. At the end of the modules, the kids shared a presentation with the parents – a business plan, a recipe book or yoga stretches, depending on their group’s focus. Heading into 2016, Ofer said there were three pillars she and her team wanted to address with the program: accessibility of fresh, healthy food; sustainability; and the sharing of knowledge and information. For the second phase of the Seed Street urban farming initiative, the focus was shifted to economic development as a more effective way of empowering community members and improving food justice, by providing food education and nutrition information. 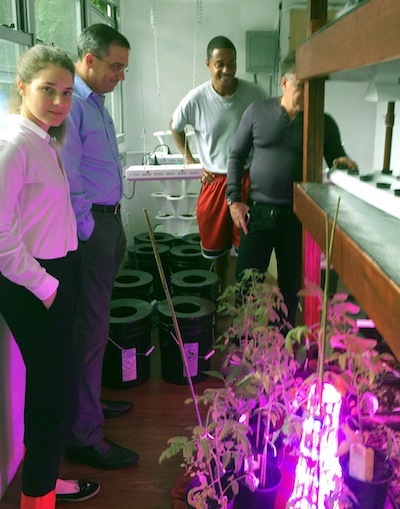 Seed Street is currently evaluating technology suppliers and sites for the commercialization of five to six container farms in Harlem. They are strengthening their partnerships and learning, through collaboration, the best ways to partner with other local youth development, food-justice, employment, and health and wellness advocacy programs. The container farms operate year-round, allowing continuity in education and providing ongoing employment for the operator, unlike an outdoor garden that closes for winter.